This is the time of year for picnics! It's absolutely gorgeous outside, school's out, and living in Florida means that I'm within a few hours drive of some of the most beautiful natural springs and beaches. 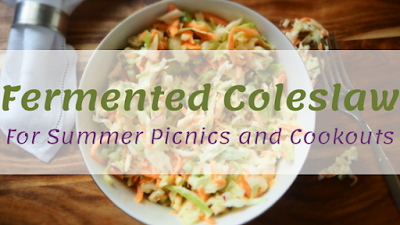 Coleslaw is a staple in almost every summertime Southern gathering, from picnics to cookouts. What better way to enjoy the summer? I actually have a handful of coleslaw recipes I tend to cycle through, and I figured that I'd share a few of them with you. A few years ago, I started fermenting every vegetable I could get my hands on. Some turned out amazing, and others needed work. However the most consistent ferments I made were cabbages and root vegetables. I love cabbage, but we all know how wonderful raw cabbage can be for our digestion. So I thought, why not make my coleslaw with fermented cabbage to ease the digestive process? It worked so well that I have not looked back, and keep coming up with new fermented coleslaw recipes. But why ferment at all? There are more bacterial cells in our bodies than there are our own cells. These bacteria are considered to be our microbiome (https://en.wikipedia.org/wiki/Microbiota). A healthy microbiome can improve immunity, metabolism, sustains the gastrointestinal tract, supports healthy mood and brain functions, aids in proper nutrient production and absorption, as well as helping maintain healthy weight. Eating fermented foods is one of the easiest ways to balance your microbiome. When your microbiome is unbalanced, a number of health issues can easily develop, including depression and digestive conditions. This is especially important after a prolonged illness and after taking antibiotics. Here is a recipe for fermented cabbage and other veggies to use in a slaw recipe. If you want to make a broccoli slaw instead of a traditional cabbage slaw, just use 6 cups of peeled and julienned broccoli stems in place of the green cabbage, and reduce the red cabbage by half. Mix together all the freshly cut vegetables and lightly salt as you pack them into a glass container (or a few mason jars). Mix the water and salt together until the salt is fully dissolved. Pour over the vegetables, leaving about ½ inch of space at the top but making sure to completely cover the veggies (if you need more of the salt water mixture, for every 1 cup of water use ¾ tablespoons of salt). Place the lid(s) on the container(s) and place in a cool dark space. Allow to sit for 3-6 weeks. Here's the basic slaw recipe I use. It's a traditional creamy Southern slaw. Whisk mayonnaise, honey, celery seeds, salt, and pepper in a large bowl to combine. Add fermented cabbage to dressing and toss to coat. Feel free to add more mayo and spices if needed. Cover and chill until ready to serve, overnight is best but a minimum of 2 hours. Fermenting the traditional way does take some time. If you want a probiotic coleslaw that can be made in 1 afternoon, try this Kombucha Slaw. In one bowl, mix together the vegetables. In a second bowl, whisk together remaining ingredients. Pour dressing over vegetables and toss to coat. Cover and chill until ready to serve, overnight is best but a minimum of 2 hours. I have always enjoyed playing around with traditional recipes. This coleslaw was inspired by an Apple Fennel slaw I had at a local restaurant once. I'm not really a fan of fennel, but it was super tasty. So the next time I made coleslaw I added apples and created my own, fennel-free, version of that Sweet and Sour Slaw. In one bowl, combine yogurt, mayo, honey, pepper, mustard, and poppy seeds. Whisk well to combine. In another, larger, bowl, combine remaining ingredients. Pour dressing over vegetables and toss to coat. Cover and chill until ready to serve, overnight is best but a minimum of 2 hours. This recipe uses mashed avocado in place of mayonnaise. However, the best part is the ability to use whatever veggies you want in the fermented veggies mix, this is a great way to use any veggies your garden may have produced in excess. This is also great made with Zucchini and Summer Squash. Strain the fermented veggies and add in the fresh ones. In a different bowl, combine dressing ingredients and mix well (this might work even better in a food processor or blender). If the dressing is a bit thick, add in a bit of the liquid you strained from the fermented veggies. Combine both mixtures and toss to coat. Cover and chill until ready to serve, overnight is best but a minimum of 2 hours. I hope you enjoy these Coleslaw recipes! If you have any questions or comments, please leave them below!